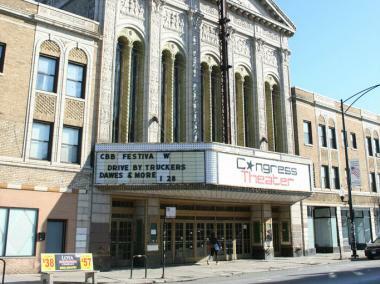 The Congress Theater at 2135 N. Milwaukee Ave.
LOGAN SQUARE — Some of the biggest names in EDM have played the Congress Theater in Logan Square, but electronic dance music is now banned from the old movie palace under an agreement between the city of Chicago and the theater's embattled owner. The Congress, w hich has been shut down since losing its liquor license last year, has faced opposition from the neighbors over EDM shows and the crowds they generated. Now, under an agreement signed by the city and the Congress' owner on July 30, EDM is banned from the theater — regardless of whether it is sold to a new operator. The conditions apply to “the business address, the licensee, and to all officers, managers, partners, and direct or indirect owners of the licensed entity. The sale of the business to other person purchasing the stock or membership units of the licensed entity does not void the conditions of this Plan of Operations. Any and all potential new owners of the licensed entity shall be subject to the same conditions set forth in this Plan of Operation." The city defines EDM as “music created by a DJ or multiple DJs primarily using specialized equipment and software instead of traditional instruments." "... And an EDM performance shall be defined as a performance of Electronic Dance Music or any performance by a DJ or multiple DJs featured the playing of prerecorded music. Performers that incorporate electronic beats or prerecorded music in their acts shall be allowed, provided those performers either sing vocals or play an instrument(s) (or do both) during their performance." While Steadman said the ban reflects a "rising level of concern about these events and whether or not they're safe," the local alderman said the ban goes too far. Steadman, the city's liquor control commissioner, said the ban will be enforced on any new licenses, even those aside from Congress Corporation. “The city wanted [the plan of operation] at that venue because of the historic problems with Congress … the [liquor] license revocation had to do with EDM events there. The community does not want those events there,” he said. “We’re not saying EDM are all bad but in venues of this size — 5,000 seats — we don’t feel this is appropriate for the Congress." "...There's a rising level of concern about these events and whether or not they're safe, but this is about what the community wants and the type of entertainment they want to see there," Steadman said. The Congress lost its liquor license in May 2013. In May 2014, Charlie Burns, the former production manager at the Congress Theater, said he believed EDM "was the Congress' downfall." Burns said he was not directly involved in the EDM productions. But, according to Moreno, it’s not EDM that should be on trial — poor management is ultimately to blame. There's been no change in the status of the Congress' liquor license, he said, but the EDM "ground rules" have been put in place now to forewarn any new operator. Carranza would not comment about his agreement with the city.